I negotiated a hall pass and yesterday fished a 1/2 day. It’s a lot of driving for just a 1/2 day. But, hey, it’s fly fishing after all. The trout at this particular river, the Swift, are quite educated. They’re hard to catch. The water is low and clear; there they were, hanging out, gulping an emerger invisible to me, and, at times, rising in dramatic fashion. They casually ignored nearly all of my flies. Reminded me of middle school and being completely ignored by a large group of girls. Still, I made a billion casts, and, as they say, even a blind pig finds an acorn occasionally. I hooked ten rainbows and landed five. Of course, I remember all too well the ones that got away. Three fell off the hook (too soft of a hook set, small hooks don’t always set well, blah, blah, blah). Two immediately headed for a log jam and expertly broke free. But, I do relish the five big ‘bows that I landed. These are large and powerful fish. The highlight was the stocky stockie up top (video at bottom, or click here). Big. I mean muy hefty. It’s height nearly covered my hand. Perhaps, 3 lbs. 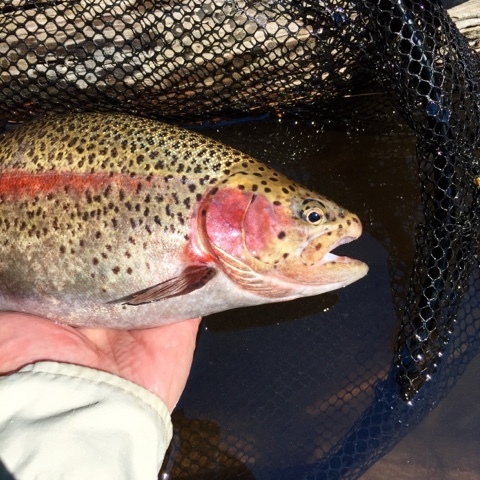 Rumor has it that the hatchery has been stocking a Montana strain of rainbows. That might explain this trout’s Rocky Mountain-sized waistline. Well, this Fat Albert of a fish also headed for a log jam, pulled my line under a sunken log, and was going ape on the other side. Thankfully, I had a sudden idea. I completely lowered the rod tip and pointed it at the fish. Feeling no resistance, the critter thought it was free and stopped streaking around. Once it was calm, I slowly pulled in line, lulled the fish under the log, and once clear, re-raised the rod tip. Fat Albert then resumed its high-drama behavior, until it slid safely into my net. Come to Daddy, fish. A good day. These trout are educated. But, slowly and surely, I am, too. Got some beauties, all over 14 inches. Since the water temp as 72, I trolled to the deepest part of the lake 45 feet and had one hit after another. Golden Demon size 10 strikes again. Any time you want to troll for them ( great in lakes) let me know . Thanks for the offer! Hope all is well. Nothing beats a day with rod and reel. I am lucky to live in an area of NJ where I can cast a spin or fly rod within 5 minutes drive of our home in Red Bank. I KindFish for bass, trout, and carp and been having a terrific time using flys and poppers. I’ve also been stalking some really smart carp in a pond down the road the last few days but have not had any luck getting them to strike. I think I have finally figured out the bait and the cast I need to clear the overhangs. If I am wrong, lucky me — I’ll just have to keep trying. Great that you have so much water near you!